Nice vintage patina work (on the raw brass option) by Design Team Coordinator Miz Bella (Kim Ayers) using Liver of Sulphur. 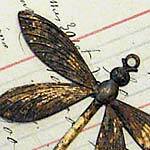 Beautifully detailed, stylized dragonfly. Raw brass (or vintage patinaed brass). Flat and hollow back. 64 x 51mm (almost 2" tall including the loop). 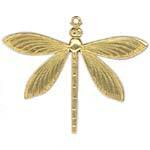 All brass is lead free and made in USA. It can be used "as is" (without bending it) or you can bend it around a cabochon or other object (I'd suggest using Bail-Making Pliers to better control the curves when bending).